The Ban craft village produces arguably the most delicious soy sauce in Ban Township, Yen Nhan District, Hung Yen Province. Ban soy sauce is so popular because it is made from large-grain sticky rice, small-grain soy bean, and in particular dinged-well water. There is only one well in Ban Village to supply the water to make the soy sauce, which is its sole purpose. 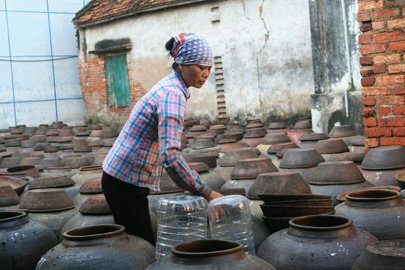 Therefore, coming to Ban village to witness the sauce’s production in Hung Yen is recommended to tourists as it is a fascinating sight around harvest time. March to August is that time for the villagers, so expect to see hundreds of jars in diverse sizes filling yards in every household. Making soy sauce is not difficult but making Ban soy sauce is an art-form. Producers have to wash the rice carefully then soak it in water and cooked into sticky rice, next scatter the sticky rice onto a large bamboo flat basket and dry it in an airy place until the rice turns yellow. Soy beans must be roasted until the bean is brown and then the beans are soaked in a clean jar for one week. After the beans have fermented, producers will add a little salt and more soy beans into the water and stir regularly. The sauce must be fermented on sunny days. Coming to Hung Yen, tourists will also be suggested to visit the Pho Hien relic complex, of which Mau Temple is a highlight and a mystery. Once stepping into the temple, travelers will be amazed by the huge seven-hundred-year-old tree which makes a domed gate for the temple. Another attraction tourists should not miss is the huge longan tree, called Nhan To, in front of Hien Pagoda. Around 300 years old, the tree is a sacred place for locals as they believe the tree brings prosperity to the land. Another relic of the Pho Hien relic complex worth visiting is Thien Hau Temple, Dong Do-Quang Hoi Temple and Chuong (Bell) Pagoda which is endowed with poetic scenery and boasts a stone bridge spanning a lotus pond and 18 statues of Arhats. Hung Yen Literature Temple holds a collection of ancient steles. Pho Hien also has stunning Vietnamese architecture, which is decorated with the colors of folk belief and religion, and some are considered high in artistic value. Along with their architectural features, these relics have preserved utensils for religious offerings, palanquins, hammocks, horizontal lacquered boards and many pairs of wood panels with skillfully-inscribed parallel sentences. More importantly, the relics of Pho Hien preserve their innate ancient beauty. With the wet rice civilization and culture, we catch the colors of bronze, stone, wood, tile and soil on each roof, door and path, which create a sense of immortality of each relic. With its role as a key link from the traffic artery of the Red River, Pho Hien was once a frontal port of Thang Long Citadel that opened to the sea, ranking second in importance to Hanoi, as goes an old Vietnamese saying. Today, Pho Hien residents are embracing an ambition to revive its glorious past.